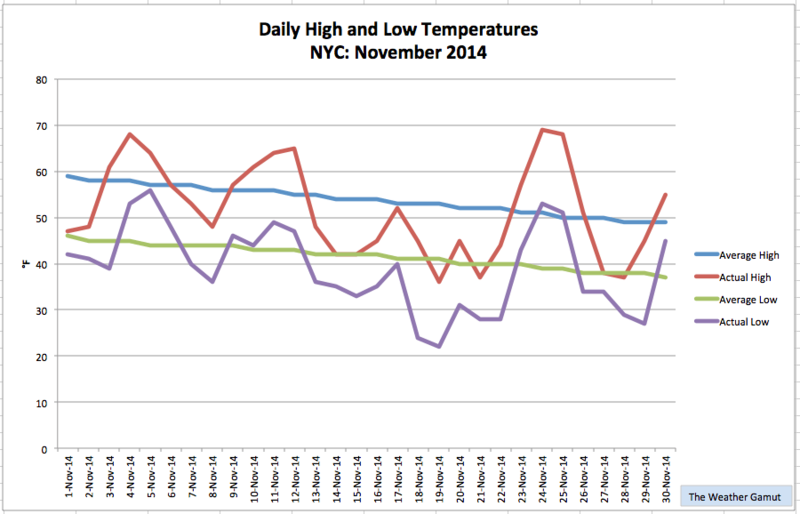 November 2014 was another rollercoaster of a month in New York City in terms of weather. We had highs ranging from a relatively balmy 69°F to a chilly 36°F. In the end though, with 17 out of 30 days posting below average readings, the cold won out. The extended cold snaps helped lower the city’s mean temperature to 45.3°F, which is 2.7°F below normal. Precipitation this November was fairly abundant. 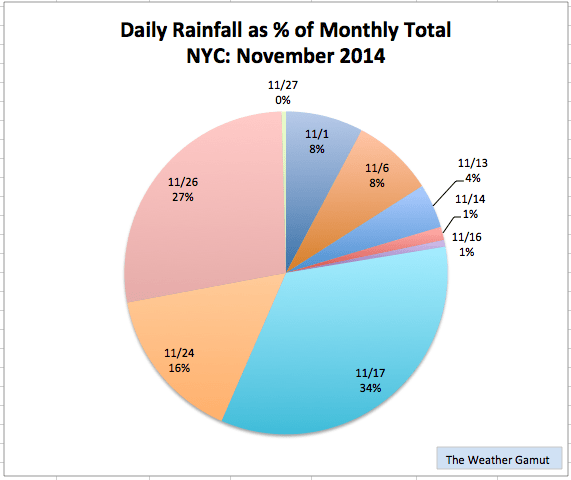 NYC received 4.51 inches of rain, which is 0.49 inches above average. Most of this fell during two significant rain events that each produced more than an inch of rain in 24-hours. The city also saw its first measurable snowfall of the season with 0.2 inches accumulating in Central Park. Nonetheless, following a parched August and September, the city is still listed as “abnormally dry” on the latest report from the US Drought Monitor. This entry was posted in weather and tagged cold, nyc, snow, stats by Melissa Fleming. Bookmark the permalink.